Watch our Frequent Flyer Wallcovering video. A slight texture pairs with a geometric print to create Frequent Flyer – a playful yet elegant design, perfectly paired with a chic and simplistic background. Exclusively from LEVEY. 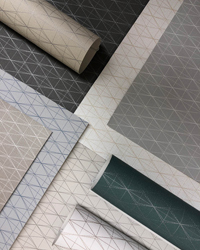 Available in a modern palette of nine colour variations – offset linear diamonds intertwine with horizontal and vertical lines make up this playful, geometric addition to our York Design Gallery, Inspired Art collection of Type II Commercial vinyl wallcoverings. 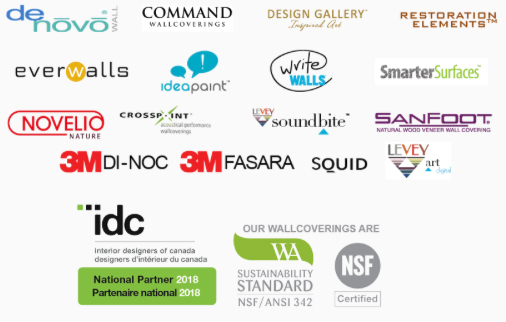 Printed upon a vinyl surface with a non-woven substrate backing, this highly durable commercial wallcovering passes the high fire safety standards of CAN/ULC S102.-10 and ASTM E-84 required for public environments.